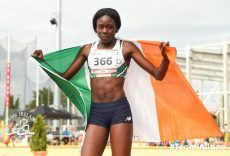 Team Ireland’s Rhasidat Adekele secured Ireland’s fourth medal of this year’s European Youth Olympics Festival this afternoon. The Tallaght athlete finished second in the 200m final with a time of 23.81, taking Ireland’s second sprint medal of the Championships following Patience Jumbo-Gula’s bronze in the 100m Final. Lara Gillespie secured silver in the Girls Cycling Time Trial, and Ireland’s medal haul to date is completed by Cavan’s Jade Williams who won bronze in the Hammer on Tuesday.